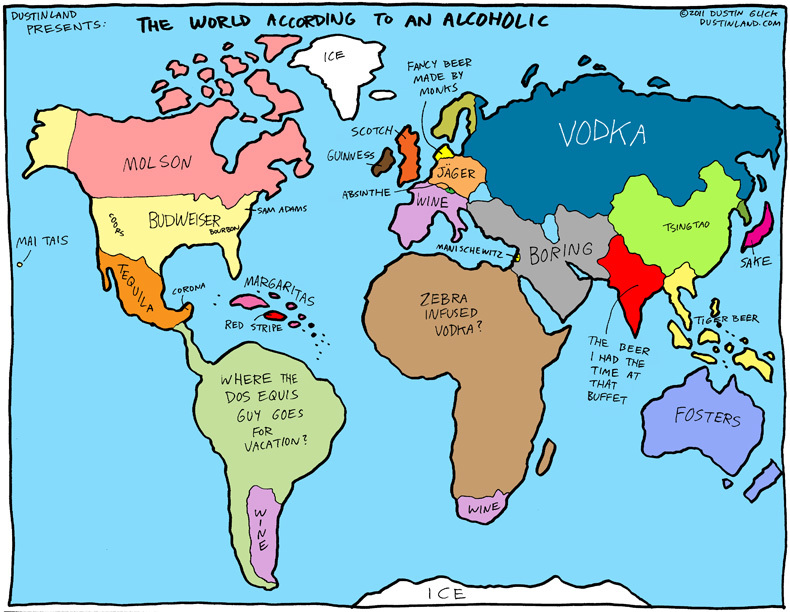 Dustin Glick of Dustinland has created a funny illustrated map of the world according to an alcoholic. Each country is named after a stereotypical local spirit, with a few notable exceptions: South America has been renamed "Where the Dos Equis Guy Goes for Vacation," Greenland is just "Ice," and the Middle East is wholly characterized as "Boring." As "The World According to an Alcoholic" presents Earth, Canada is the land of Molson, whereas the U.S. is primarily dominated by Budweiser with regional pockets of Sam Adams, Coors and bourbon. Australia, predictably, is the land of Foster's. 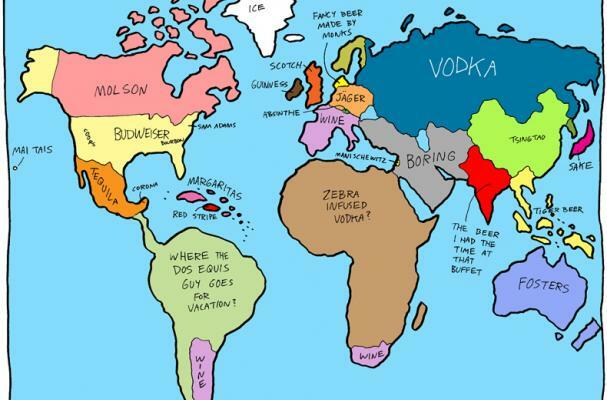 Do you agree with the map's generalizations? I am very disappointed because he erased Greece from the map, which he could have named Ouzo. Not a very savvy alcoholic, is he? You guys don't people from asia, what we drink, this is non-sense! Research before u post something! What a lame map! ...''boring'' for the Balkans ...you have no idea just showing your ignorance!